Fall is on tap at the craft breweries in Virginia’s Blue Ridge! Oktoberfest brews, dark ales, pumpkin, and other fall spice blends take center stage in our great seasonal beers. You’ll be surrounded by beautiful foliage and experiencing one of the best times of the year as you enjoy these delicious fall beers in Virginia’s Blue Ridge. 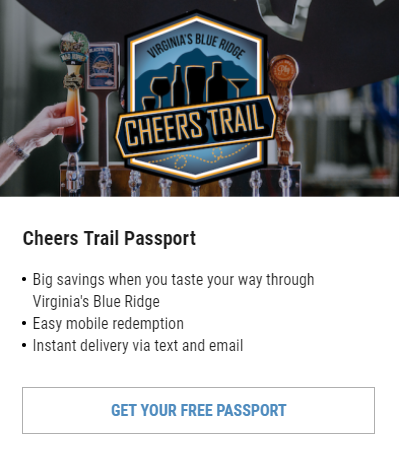 Local breweries are part of Virginia’s Blue Ridge Cheers Trail, so make you sure you download the Cheers Trail Passport prior to your visit and find out how you can check-in to receive special offers and a free Cheers Trail t-shirt! The traditional German Marzenbier is the inspiration for Deschutes Brewery’s Hopzeit Autumn IPA (ABV: 7%, IBUs: 60). The beer features the herbal, fruity and spicy notes that create a delicious fall beer. Incorporate it into your veggie tray with this recipe for Hopzeit Hummus. The Schwarzbier Dark Lager is one of Deschutes Brewery’s collaboration creations. To celebrate Deschutes’ 30th anniversary, the brewery is partnering with former Deschutes employees who now work at other breweries, and the Schwarzbier (ABV: 6%, IBUs: 30) is a collaboration with Tim Gossack, who’s now part of the team at Bell’s Brewery. It’s a dark lager with nutty and chocolate notes that’s perfect for a cool day. If you can’t make it to Germany, celebrate the season with an Oktoberfest (ABV: 5.7%, IBUs: 32) brew at Chaos Mountain. It’s light and crisp with notes of toasted malt. Ballast Point Brewing Company puts a fall twist on its Piper Down Scottish Red Ale by adding roasted pumpkin to create the Pumpkin Down (ABV: 5.8%). It’s a tasty mix of caramel & toffee malt with pumpkin and spice. Ballast Point packs the celebration and fun of Oktoberfest into a bottle (or pint!) with its Dead Ringer lager (ABV: 6%, IBUs: 26). It’s a dark reddish brown lager that features toasted malt with sweet, caramel toffee flavors. Kudos to Olde Salem Brewing Company for essentially creating a brown ale on steroids. The Bourbon Cider Barrel Aged Double Plank (ABV: 10%, IBUs: 64) is a brown ale that’s been aged in bourbon barrels that also contained cider, and brown sugar is also added to the brew. It’s smooth and full of flavor. The Starr Hill Pilot Brewery & Side Stage in Roanoke features a variety of delicious brews in its rotation of 23 taps, with the Festie Oktoberfest Lager and Last Leaf Maple Brown Ale being two of our fall favorites. The Festie (ABV: 4.8%, IBUs: 12) is a rich, malty lager that serves as a tribute to the traditional German lager. The Last Leaf Maple Brown Ale (ABV: 6.1%) is an English Brown Ale that includes real Virginia maple syrup in the blend. Grab a 6-pack to take home with you and use this recipe to make a batch of Last Leaf Maple Chocolate Chip Pancakes! We’re quite certain the Oktoberfest lager (ABV: 5.6%, IBUs: 18) at Beale’s tastes even better when enjoyed in one of the brewery’s commemorative Oktoberfest steins! You should pair it with a soft pretzel and chow down on the delicious sliced brisket. We also can’t wait for the Spiced Apple Ale, which is fermented with local apple cider, scheduled to be released on October 20! Leave the lederhosen at home and toast to the season with a few friends as you drink the Marvin the Marzen (ABV: 5.2%, IBUs: 19) German style lager at Big Lick Brewing Company. There’s also the Walk the World Schwarzbier (ABV: 5%, IBUs: 27), a sessionable dark lager that’s named in honor of a former Big Lick bartender who hiked the entire Appalachian Trail. Sounds like the perfect beer to enjoy as you hang out by one of the fire pits on the Big Lick patio and recall some of your best outdoor adventures in Virginia’s Blue Ridge. Hammer & Forge Brewing Company gets into the fall spirit with a collection of fun seasonal brews! The Night Witches Schwarzbier (ABV: 5.25%, IBUs: 29) and Boonestoberfest (ABV: 6.4%, IBUs: 46) marzen are currently on tap, but there’s more to come. As part of its Halloween Party on October 27, Hammer & Forge will be releasing La Calabaza de Fuego (ABV: 8.6%, IBUs: 36), a spiced pumpkin imperial stout. “The Fire Pumpkin” incorporates an impressive mix of flavors, including cinnamon, vanilla, and habanero. The No Recourse Pumpkin Ale (ABV: 7.5%) has been described as a taste of “fall in your mouth” with its mix of pumpkin and pumpkin pie spices. It’s also a deep copper golden color that will remind you of the beautiful fall foliage of the surrounding mountains. For a darker option at A Few Old Goats Brewing, try the Outhouse Porter (ABV: 6.5%) with its notes of chocolate, roasted barley, and slightly smoky flavor. “Surprisingly light and crisp” is the description of one Fest Bier (ABV: 5.6%) fan on Untappd. This seasonal light lager is Parkway Brewing Company’s homage to Oktoberfest. If you’re looking for something a bit stronger, check out the Reformator (ABV: 7.6%) doppelbock. It features a deep reddish brown color and contains flavors of dried fruit, brandy, caramel, plum and toasted malt. The malty flavor is the highlight of Soaring Ridge’s No Turning Bock (ABV: 5.4%, IBUs: 24). According to Alan on Untappd, this beer is “clean and malty with a hint of nut flavor.” It’s a light brew that also contains notes of fruit and hazelnut. 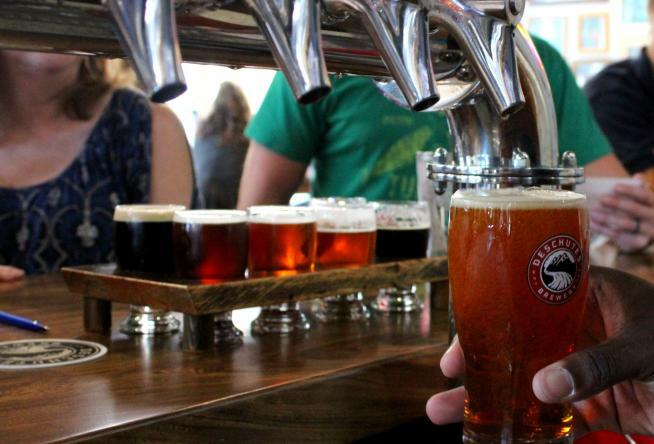 Ready for more ways to enjoy craft beer in the region? Book a spot on Virginia’s Blue Ridge Brewery Tour, check out the local beer & wine shops, and take a look at the calendar to learn about upcoming beer-related events. Don’t forget to share your fun with us on social media by using the #VBRcheers hashtag. Please remember to always drink responsibly.